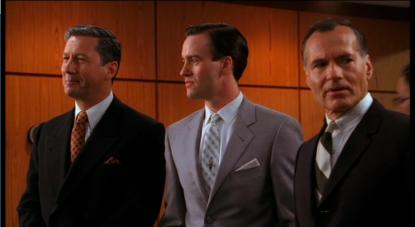 Watching the latest episode of Mad Men last night, I knew I recognised the actor playing Guy Mackendrick, the bright young thing from the British head office who comes over to Madison Avenue to shake up the management structure but leaves with more--or rather, less--than he bargained for. As I only watch TV shows on my computer, I couldn't check IMDb on my laptop mid-show, but I did try to look him up on the shiny new IMDb iPhone app (which finally works outside the US). The app is well designed and very easy to use but it doesn't work well for TV shows with a long cast list and an even longer list of people who just appear in one or two episodes and so who only show up on the "episode cast" lists rather the overall list. I did look up young Guy today, though, and of course he was played by Thomas Wyatt (the elder) Jamie Thomas King, last seen (by me, at least) being the only one of the men Anne Boleyn was accused of shagging not to be the executed (and the only one she might actually have shagged, in her pre-Henry VIII days, of course) in that wonderful, hysterical historical drama that is The Tudors. It's not really a surprise that I didn't recognise him, even though I thought he was quite hot in The Tudors (this is possibly just because I am interested in the real Thomas Wyatt). After all, in TT, his standard apparel was a ruff, doublet and tights with longish hair and plenty of facial hair. Quite different from the smartly dressed, clean shaven, suited and booted gent who showed up at Stirling Cooper in MM this week, shown in the middle of this image. Much as I normally enjoy the '60s chic of the ad-mad men, I think I preferred King in TT, quite possibly because his character is much more sympathetic than in MM. It's something of a moot point, anyway, given that it's unlikely Mr Mackendrick will be making a return to MM any time soon and unless TT decides to completely eschew any semblance of historical accuracy, Thomas Wyatt won't be around to watch the world's most Oirish Henry VIII get it on with the 16th century's answer to Serena van der Woodsen, Katherine Howard, this season.